SAILOR Fleet One enables data connectivity up to 100kbps and voice calling on a single line. Its capabilities offer significant communications functionality for recreational and fishing users who need reliable voice communications and Internet connectivity on board, when cellular networks aren’t available, or just don’t offer the quality needed for good, reliable communication. SAILOR Fleet One is designed to the same high standards as the existing SAILOR FleetBroadband product line; quality that more than 35,000 clients have experienced so far. With ease of use and durability at the forefront, SAILOR Fleet One can be relied upon to provide reliable, high quality communications, whether cruising offshore or fishing for a living. 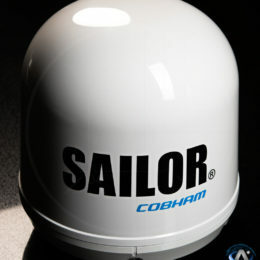 The SAILOR Fleet One antenna is light and easy to install, even on small boats, and connecting to the below deck equipment is simple enough that keen owners can handle the installation and maintenance themselves. It may be small, but it packs enough power to deliver plenty of bandwidth for email, web browsing, and social media sites. SAILOR Fleet One is the ideal communication solution for yachts, motorboats, and small fishing vessels. Enabling leisure sailors and fishermen to stay in contact with family, friends and business partner outside the mobile telephone coverage. Based on the well-proven SAILOR platform, SAILOR Fleet One offers a cost effective hardware solution and together with the tailored airtime, a satellite communication solution within reach. SAILOR Fleet One is a maritime broadband system, providing simultaneous high-speed data and voice communication via satellite, using Inmarsat BGAN (Broadband Global Area Network). Fleet One is a global service, however, the specific Fleet One tariff is only available in selected geographies (green areas on coverage map below). Roaming outside the Fleet One home region areas will have an impact on the airtime prices. Please consult Inmarsat Airtime providers for specific information with regards to airtime prices and specific coverage. The special Fleet One tariff will apply to traffic originating within the Fleet one service area. Meaning, e.g. leisure sailors will be able to use the Fleet One tariff in the Mediterranean during summer and the Caribbean during winter with the same subscription. However, when crossing the Atlantic users will be outside a home region and roaming costs will apply. Please note that a Fleet One SIM can only be used with a Fleet One terminal. Fleet One has been designed with the fishing industry in mind, in order to meet specific operational demands for cost effective data and voice simultaneously through a compact antenna, all with specialized pricing plans and seasonal flexibility. Communications assist with fishing operations such as navigation, route planning/optimizations, fish finding, fisheries governance and other regulations, LIFE fishing, catch reporting whilst reducing fuel costs. For the fishermen it can improve their morale onboard by low cost calls and emails to family at home, being able to check the news or sports results and feeling connected on the fishing boat to life on the shore. This can all be done whilst keeping a tight control on costs. Fleet One supports Inmarsat’s unique ‘505’ safety service, which in an emergency routes you directly to a MRCC. This means that in one phone call you can alert the safety services of your position and nature of distress, by reassuringly speaking to the Search and Rescue Services knowing that assistance is on its way. Fleet One provides constant access to voice and data services, in a very cost effective manner. Fleet One gives a very cost effective and competitive pricing for sailors and leisure users to access the Internet, write emails, and make phone calls. Fleet One has a standard “plug and play” Ethernet connection to a computer, and can support smart phones, tablets, and computers via an additional wireless router, allowing access to specific maritime applications. A wireless router would allow multiple people to access the Internet and email at the same time. You can depend on Inmarsat, whatever the weather. We provide the most robust communications links, with average network availability greater than any mobile phone provider and exceeding 99.9%. Fleet One terminals are specifically designed for use within the maritime environment. The terminal is quick and easy to install, with additional Wi-Fi capability to allow access to smartphones/tablets as at home. The terminals have been tested and approved to Inmarsat’s exacting standards. The SAILOR Fleet One is ideal for yachts, motorboats and small fishing vessels and would be the natural upgrade for users that are currently using an Inmarsat Mini-M terminal or have a need for a low-cost, easy to install hardware solution.